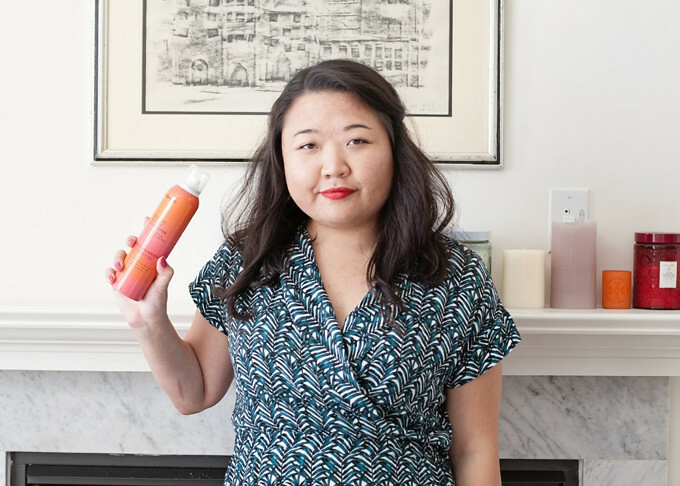 Eva NYC kindly sent me a selection of products from their hair care line and over the past few months I’ve chronicled my favorite Eva NYC-assisted hairstyles. There are two stand-out products that I liked best. The first product is the Speed It Up Blow-Dry Spray (6oz, $24), which just works. The first time I used it, I couldn’t believe how fast my hair dried. I like use about 3-5 sprays on freshly washed hair, then comb through to distribute the product. Then five minutes with a hair dryer produces sleek, dry hair. It’s basically a miracle product. My second favorite is Eva NYC’s Almighty Pro-Lite Dryer ($140 at eva-nyc.com). I have the hair dryer in Galaxy, which you can see in action below. I’m using it with one of the attachments that’s best for a blowout. It has three speeds and two heat settings, and when they’re set to the highest it dries my hair in five minutes. Less if I use the Speed It Up Blow-Dry Spray. The hair dryer also comes with a diffuser attachment for curly hair, but I could never get used to using it. I almost always use a hair dryer only for straightening, so I don’t need the extra attachment anyway. All of the hairstyles above were made possible with Eva NYC hair care! Another product I liked a lot is the Forget Me Knot Dry Conditioner (5.1oz, $24). I use it on my dry ends the day after shampooing. Since I have coarse hair, my ends don’t always look and feel the best. The dry conditioner makes them feel so much softer. The only reason the Forget Me Knot Dry Conditioner isn’t also a favorite is because the scent is very strong. It’s best to use sparingly. I noticed that the scent bothers me for about 2 hours after spraying it on my hair and interferes with any fragrance I wear, so I don’t use it very often. 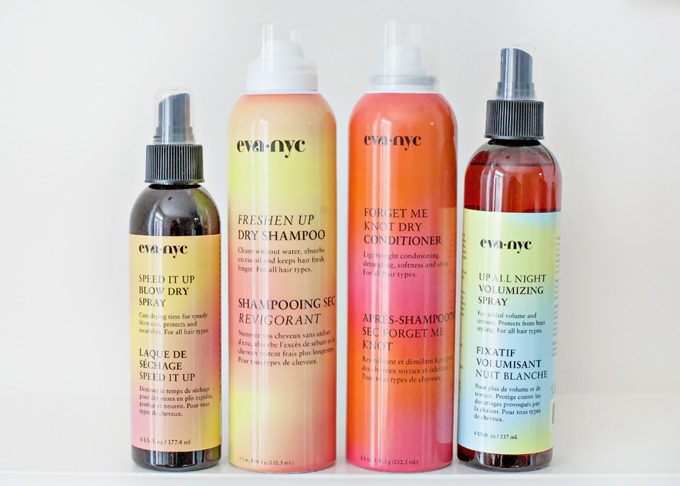 Eva NYC gifted me the products in this post with no obligation to write about them. All thoughts are my own. I like the idea of spray to speed up a blow dry – right now I have to let my hair air dry for about an hour before I can blowdry otherwise it will just take way too long. It is so amazing! One of the best products I’ve ever used and totally up there with Living Proof. My hair dries so fast with it now. Wow that express blow-dry product sounds amazing, I would love this, I am going to check them out. And yep staying warm, crazy weather huh. I hardly ever recommend hair care products because I think the vast majority just don’t work, but the Speed It Up spray is a miracle product. Dries my hair in half the time! Alex, I really love these products. I would really value being able to dry my hair and less time. Especially in the winter. By the way, your house looks so very lovely.